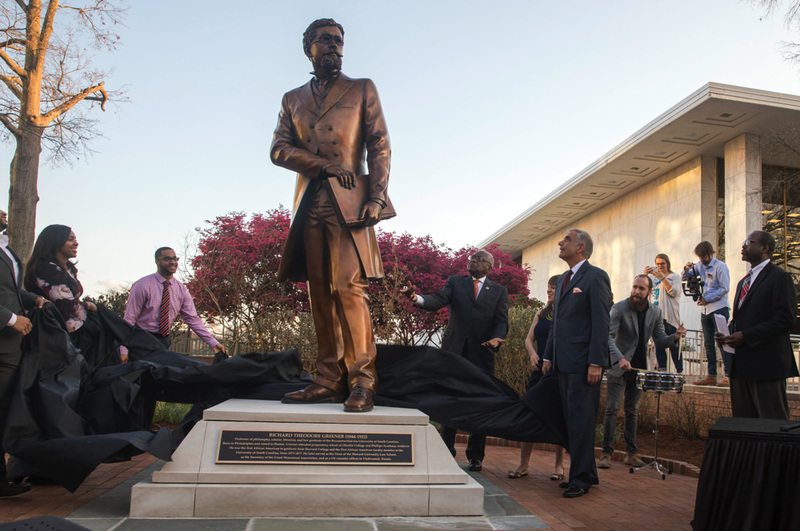 University of South Carolina president Harris Pastides (foreground, second from right) and Congressman James Clyburn (to the president’s right) help with the unveiling. 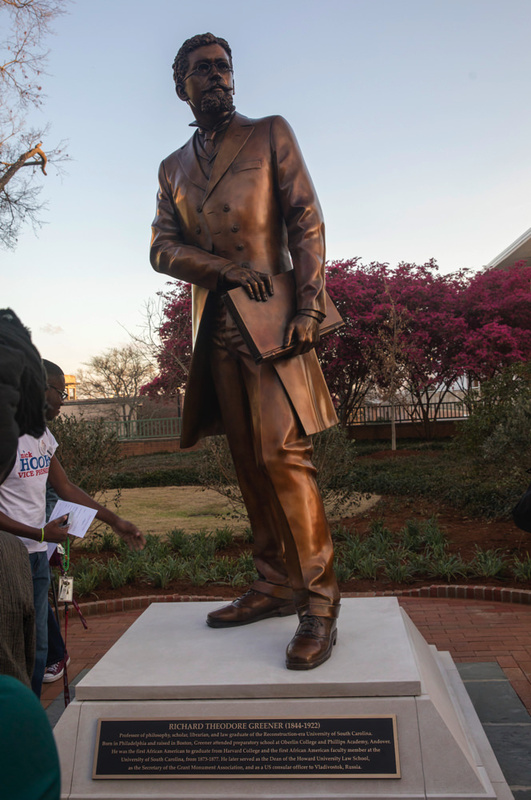 With the unveiling yesterday on its central campus of a nine-foot statue of lawyer, educator, and diplomat Richard T. Greener , the University of South Carolina acknowledged a notable individual and a significant moment in its own history : the Reconstruction era, when it became one of the only Southern state universities to admit, and grant degrees to, African-American students. Greener himself benefited from that opportunity. While teaching courses there in philosophy, Latin, and Greek as the institution’s first African-American professor, Harvard College’s first black graduate also studied law, earning his degree in 1876, a year before a new state administration barred black students from the school. This plaque honoring Greener is located in Harvard Square. Greener, who had spent part of his youth in Cambridge and entered the College as a 21-year-old after preparing at Oberlin and Andover, would go on to become dean of Howard University Law School and to enter government service. In 1898, he was named U.S. commercial agent in Vladivostok. Harvard installed a portrait of Greener  in Annenberg Hall in 2016, and a Cambridge Historical Commission plaque honoring him is mounted on the façade of College House in Harvard Square, at 1430 Massachusetts Avenue. To learn more about Greener, watch Richard T. Greener: A man of firsts is reintroduced to the world, a video  from the University of South Carolina.